Working on samples for next month’s quilty classes at gather here, and I am almost done with this one. Going to make this short and sweet so I can get back to it now (while the wees sleep). Speaking of which, they are rather fond of this quilt already. That is beautiful. I hope you do the hexicoasters again. I missed the signup, but I'd still love to take it! I love the way you quilted the center! 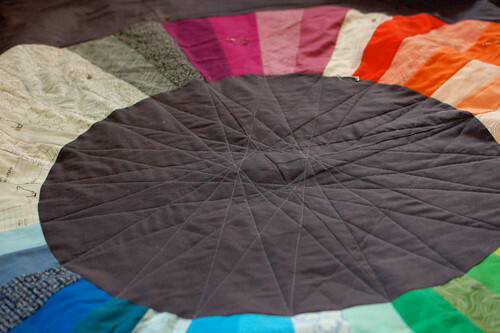 I made the Purl Color Wheel quilt a few years ago and just quilted across the middle. There was too much stitching and it puckered.